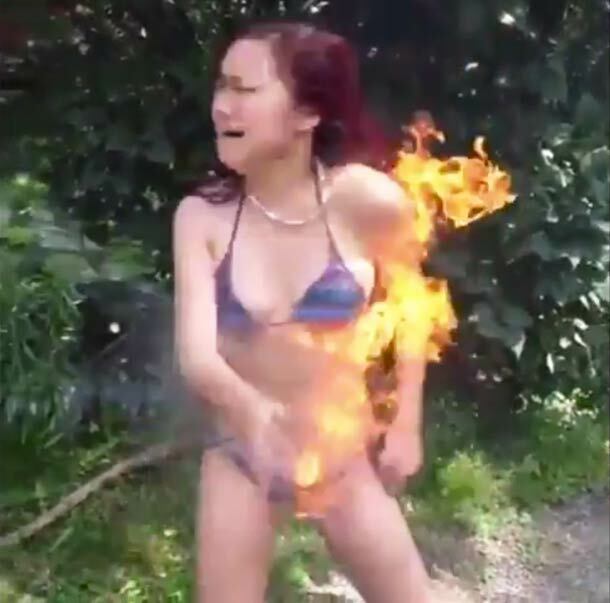 The newest not new trend of teens lighting themselves on fire, better known as the “Fire Challenge” has been heating up thanks to social media. I never thought lighting yourself on fire would be on the list of things to worry about during the teen years. My supremely responsible and successful adult nephew tells me this is nothing new — that in his “younger” years kids used to spray Axe Body Spray on their hands and light them on fire. Perfect. After seeing one of the videos that has gone viral (I’m sure it was totally worth the severe burns), I had a flashback of talking to my kids as toddlers when they’d be in the kitchen with me. “Danger, danger,” I’d say, “HOT!” if they got too close to the stove. If you’re reading this, chances are you’ve seen pictures or videos currently making the rounds. The majority of teens comfortably dumb enough (thanks to their underdeveloped brains) to try this are boys, but I was surprised to find that there are indeed girls participating as well. I’m betting this young lady wishes she hadn’t. Her skin may not be burning yet, but her bathing suit… and long hair(!) will. Adolescents are notorious for being more impulsive and seeking out higher levels of stimulation. That is why you often see them listening to very loud music, driving very fast, and even enhancing their sensory experiences with anything from pounding three Red Bulls to harder drugs. They also don’t have the experience or developed reasoning skills to weigh the ramifications of high-risk behavior. Therefore, they may decide that the benefits of a certain behavior are worth the risk. The benefits usually are that they gain peer acceptance or some form of instant gratification. Fire setting (aka pyromania) has been long recognized and researched and treatment models exist for this type of behavior. Unfortunately, setting ONESELF on fire is such a new phenomenon that mental health professionals don’t really have a handle on why kids do it and what the best course for treatment is yet. If you haven’t already, please do talk to your kids about the seriousness of this.